If you secretly resent those crafty parents who can effortlessly sew together adorable Halloween costumes for all their kids, then you have no reason to resent my wife and me. All of our skill at producing cute costumes comes at a bargain price from a discount store. I have created many of my own costumes for Halloween parties over the years, but my creations have been more conceptual. One year, I was a window. Another time, I did Halloween as part of this complete breakfast. I got a lot of hungry looks from squirrels that night. The Angry Owl. If I were an animal who regularly coughed up balls of mouse hair and bones, I’d be angry too. Kids’ costumes are supposed to be cute and, more or less, easily identifiable. If this weren’t enough of a stake in my creative heart, they are not supposed to be even slightly dangerous. I was never able to guarantee that the costumes I’d made for myself wouldn’t accidentally poke somebody in the eye. That’s not really a selling point at a kids’ party. My wife and I aren’t very artistically talented, if you take away the part of art that is left to the beholder’s imagination. Consequently, my wife spends part of October shopping for boys’ Halloween costumes. The big boy decides what he wants to be on his own. Last year, Halloween coincided with his skunk phase. All boys go through a skunk phase, right? This year, he’ll be a soldier. He’s known this for at least six months. Easy. The Ambivalent Frog. The good news is he isn’t an owl. The bad news: Do owls eat frogs? The little boy is another story. Finding an appropriate costume for a toddler can be an adventure. Of course, it must be cute. But it also must not make him topple over at every step. Most importantly, it must not induce him into a screaming fit every time it comes near him. Nobody is cute wearing a screaming fit. After much browsing, Mommy and Toddler narrowed down the candidates to three. The pumpkin costume had the advantage of being inexpensive, but it didn’t quite ring the bell on the cuteness scale. 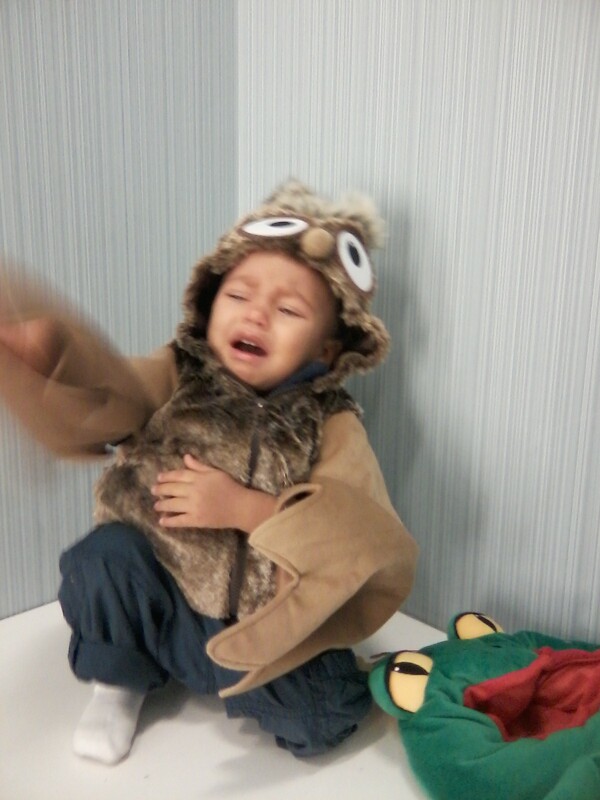 The owl had the potential to be very cute, but sometimes a little boy just doesn’t want to be an owl. The owl was presented to him on two separate occasions, resulting in two separate screaming fits. With regret, Mommy crossed the owl off the list. The frog is definitely cute. 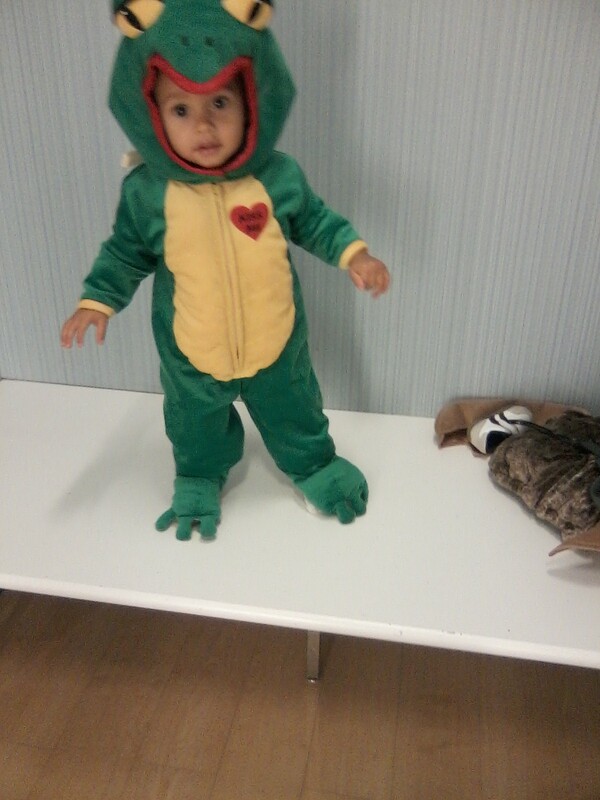 The boy let himself be clothed in frog with only a mild look of reservation. Whether or not the frog will make him topple over at every step remains to be seen. But after the owl experience, we’ll find a way to live with that. This Halloween, if you see a tired, prematurely aged man carrying an adorable frog on his shoulders, you’ll know who they are. Yes, the man may appear to be wilting under the weight, but rest assured, so long as the frog is not screaming and crying, that little old man is perfectly content. This entry was posted in Holiday Hijinks and tagged animals, children, Dads, family, fatherhood, Halloween, humor, kids, Sons. Writing should be truthful, right? They look adorable! Anything more than throwing a sheet over a kid’s head is creative in my opinion. In that case, TJ Maxx and my wife are very creative. Now, if we can just keep the crying to a minimum, it’ll be a successful Halloween all around. Your smash mouth basketball player wanted to be a princess? Hard to figure. When we were small we were hobos every year. My mother would dress us up in old clothes and rub our faces with a burnt cork (that was our hobo beard). She’d get dressed up too..one year she wore an old butcher’s coat, rubber gloves, rubber boots and painted her face green. I don’t think we even knew that they sold Halloween costumes. As long as we got candy we were happy. I wish candy still made me that happy! I wore mostly homemade costumes too. It didn’t make sense to spend money on a costume to wear trick-or-treating to 10 houses. Now, it seems like there is a Halloween event in our town every day for two weeks leading up to the 31st. At least they’re getting lots of use out of the costumes we’re paying for. I’m not sure he can tilt his head enough to see his feet. Hilarious. My daughter has definitely worn the creaming fit before, and it wasn’t even October. Oestrogen, a real lady killer. A good fit is always in season. Especially if it happens in a public place. I just can’t take the wife anywhere anymore. They can be very unpredictable. Sorry I meant to write “screaming fit” in the previous comment, for creaming fit just doesn’t make any sense. I thought maybe you were trying to make her do something with corn. Any child would have a fit if made to convert perfectly good corn into yucky creamed corn.